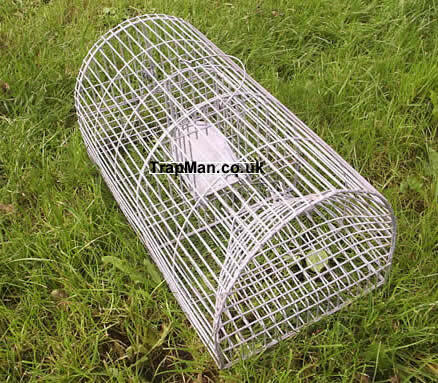 The Trap Man Monarch Rat Trap, Self resetting humane multi live catch Rat Trap. 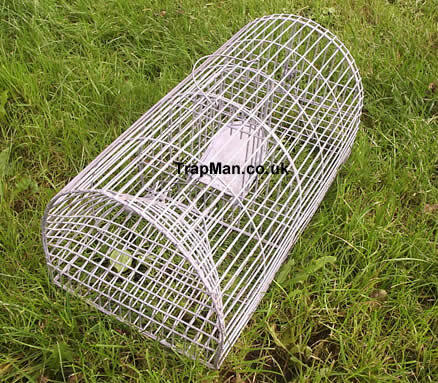 Trap a rat or lots of rats like your dad did using the same dome top Monarch Rat Trap, you remember seeing hung up in the back of your dad's shed 30 years ago. The 100 year old proven design of The Monarch Rat Trap has endured for over a century, humanely, safely and securely catching rats. 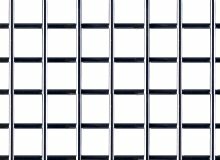 Hand made from 1.5mm diameter steel mesh welded and formed to shape then hot dipped galvanized after manufacture to give a long rust free life. A tried and tested vermin rat trap. The Multi Catch Humane Rat trap gives the option of releasing the rat alive and eliminates accidental injury to other animals and children which so often occurs when a conventional 'kill' rat trap is used. 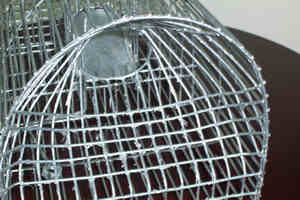 Using the The Monarch, Rat Trap is simple, bait inside the rear compartment with kipper or part cooked bacon, place the funneled entrance end 2" away from but not touching a wall, fence line or obvious rat run and at a right angle to it, so that the rats have to pass the open funnel entrance door. Pre bait just in front of the entrance funnel with bread or corn and sprinkle some through the top of trap..........NOT too much we don't want to give the rats a hearty meal we want the rats to be enticed into the funnel opening of the rat trap and through the one way door into the rear holding compartment where you placed the strong smelling bait, capture is inevitable. Please note it is better to position multi live catch Rat Trap on a solid surface to prevent the rats digging under the trap to access the bait. Also the trap will work better if no other food source is available to the rats. You may not catch the rat during the first week... or the second. Release is just as simple place the Rat Trap on the floor and turn the wing nut on the rear door, The door will hinge down and the captured rats can be removed,or more likely they will run out. 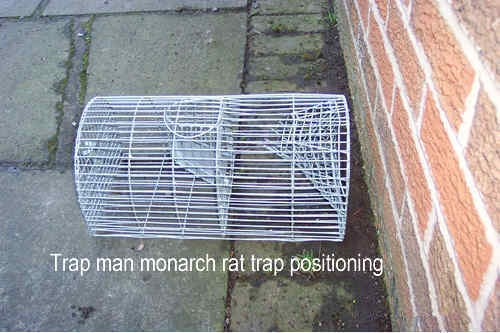 Product: Monarch repeating multi catch rat trap. You may not catch the rat during the first week... or the second. When handling, use precautions to avoid the possibility of disease transmission Use disposable rubber gloves. Apply household disinfectants at recommended concentrations to rodent droppings, nest and surrounding area, and allow for at least 15 minutes contact time before removal. Clean the area with paper towels or a mop. Thoroughly wash hands with soap and water and dispose of gloves.